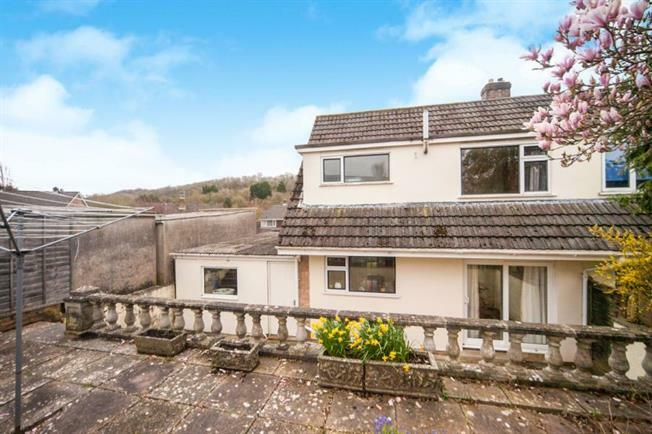 3 Bedroom Semi Detached House For Sale in Wells for Asking Price £275,000. NO ONWARD CHAIN! LOVELY VIEWS! Very well presented three bedroom semi-detached home with lapsed planning permission offering scope to extend, situated in a highly sought after location that is a short stroll into the City or the neighbouring woodland. A light, welcoming entrance hall provides access to the equally light, spacious lounge/dining room, which has dual aspect double glazed windows to the front and rear. The kitchen has an attractive, contemporary finish with wood work-surfaces, a built in fridge, oven and hob with extractor hood over, and a door to the garage. Three well presented bedrooms with large double glazed windows that provide a view of the woodland to the front and over the garden to the rear. The master bedroom has a range of built in wardrobes and all the rooms upstairs benefit from inset spotlights. The bathroom provides a white suite comprising WC, wash basin and a bath with shower over. Much larger than average (21'2 x 12'11) with an up and over door and pedestrian access door to the front, window and further door to the rear garden. Space and plumbing for utilities. Driveway parking available to the front of the garage. Two tiered rear garden that at present is stone paved for ease of maintenance. Sloping front garden that is laid to lawn and bordered with trees and shrubs. UPVC front double glazed door. Double glazed uPVC window with obscure glass. Radiator, carpeted flooring, under stair storage. UPVC double glazed door, opening onto the rear patio. Double glazed uPVC window facing the front. Radiator and gas fire, carpeted flooring. Double glazed uPVC window facing the rear overlooking the garden. Radiator, vinyl flooring. Wood work surface fitted, wall and base units, stainless steel sink with mixer tap and drainer, integrated electric oven, integrated gas hob, over hob extractor and space for washing machine. Double glazed uPVC window with obscure glass. Radiator, vinyl flooring.